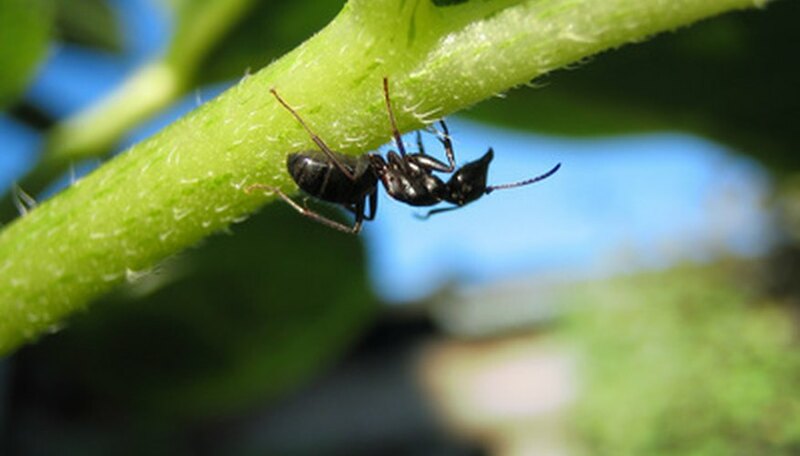 Ants are generally harmless, but an infestation of these pests can be inconvenient and unsanitary. Though commercial ant killers are available, they are also generally made of toxic chemicals that aren't the best to have around if you have pets or children. It's easy to get rid of ants using eucalyptus oil. This natural ant repellent can be used both inside and outside. The smell of eucalyptus oil is usually enough to drive ants away completely. Pour about 1 tsp. of eucalyptus oil onto the corner of a soft rag. Wipe down surfaces where the ants tend to appear, such as countertops, cupboards and around baseboards. Put about 20 drops of eucalyptus oil into a clean spray bottle. Add 2 cups of warm water to the bottle, screw on the cap and shake to mix. Spritz the natural ant repellent on items affected by the ant problem, such as on houseplants, around doorways and in showers. This eucalyptus oil ant repellent can also be easily used in outdoor areas, such as on the patio or in the garden. Repeat the eucalyptus oil treatments about once a week, or until you no longer see evidence of an ant infestation. Feed the new eucalyptus tree about a month following planting. Use a good all-purpose flowering tree fertilizer and follow the packaging instructions carefully. Repeat the application once every three years. Supplement your eucalyptus tree with chelated iron once in the spring and again in the fall. This is particularly beneficial to young specimens still in the stages of development. Follow the manufacturer’s recommendations carefully. Use slow-release fertilizers to feed other plants with differing nutritional requirements if they’re situated within or near the eucalyptus tree’s drip line. Follow the product directions carefully. Cut the desired number of eucalyptus spikes from your tree. Make sure to use extra-sharp scissors to cut the thin spikes covered in leaves. Gather the spikes and line them up so that the stem ends match up evenly. Wrap and tie a 12-inch length of twine around the ends of the stems to keep the spikes bound together. Tie the other end of the twine to a tree branch, clothesline or a hook on your front or back porch. Allow the eucalyptus spikes to hang-dry for approximately two weeks. The eucalyptus leaves will darken slightly but stay intact and retain the camphorous scent of the eucalyptus tree. Cut the eucalyptus leaves very early in the morning while the dew is still on the leaves. This is the time of day when the leaves produce the highest amount of essential oil. Wash the leaves in the sink and pat them dry with a towel. Place a thin layer of the leaves at the bottom of the ceramic jar, followed by a thin layer of the salt. Continue layering the salt and leaves until the jar is full. Seal the jar and leave it in a cool, dark place for two months. Pour out the contents of the jar into the cheesecloth and strain out the liquid. Carefully place the essential oil into the amber dropper bottle and close tightly. Store in a cool, dark place to prevent the oil from turning rancid. Fill the nonstick saucepan with the distilled water, eucalyptus leaves and lemon grass. You can obtain these fresh botanicals via your local botanical nursery or through an online retailer. Alternately, you can use clippings from your own garden, if possible. Set the temperature on a stove burner to its lowest setting. Let the contents of the pot simmer on the stove's lowest setting for approximately 45 minutes at a time to release the smells of the eucalyptus and lemon grass. Add up to five drops of essential oil of ginger to the simmering pot to add an under-note to the potpourri scent. Eucalyptus is one of the main ingredients in cough syrup, lozenges and vaporizer fluids. The pungent smell and anti-inflammatory qualities of the plant help clear a pathway through congestion. Fresh leaves in tea soothe sore throats and treat bronchitis. Ointments applied to the chest or nose help break up phlegm. Blue gum, also called Australian fever, is the cultivar most often used for medicinal purposes. Eucalyptus oils and leaves are often made into ointments to help heal parts of the body. They contain tannins which help reduce inflammation, flavonoids with antioxidant qualities and cineole which is a powerful antiseptic. Rubbing the oil on wounds, boils and arthritic areas can help heal skin more quickly and alleviate pain. As the tree grows tall relatively fast, creating a thick crown, people often use the tree as a windbreak. This protects other plants as well as buildings and other structures from harsh winds. Eucalyptus robusta works well in this role. The wood of the Eucalyptus is versatile. Some farmers grow it to sell for timber, others sell the wood to pulpwood factories to make paper. Others still sell it for fuel purposes. Since the tree reaches maturity quickly, selling the wood is a profitable activity. Prune the eucalyptus tree in the spring season or during the fall before the first frost of winter. Do not prune the eucalyptus tree during the summer. Summer heat can cause the tree to wilt quickly when the ends of its branches are exposed. Prune the ends of overgrown branches to keep the eucalyptus tree looking uniform. Heavy pruning is not necessary. Simply cut overgrown branches back level with the other branches of the tree, using pruning shears or garden loppers. Cut away dead, dying or diseased branches of the eucalyptus tree using garden loppers or your pruning shears on smaller branches. Cut these branches off where they join the main trunk of the tree.